Is now the time for a Pinoy Doctor? Despite all the timey wimey, the time for a Pinoy Who serye might be the year 2018. This is courtesy of an Instagram post from the official BBC Doctor Who account. 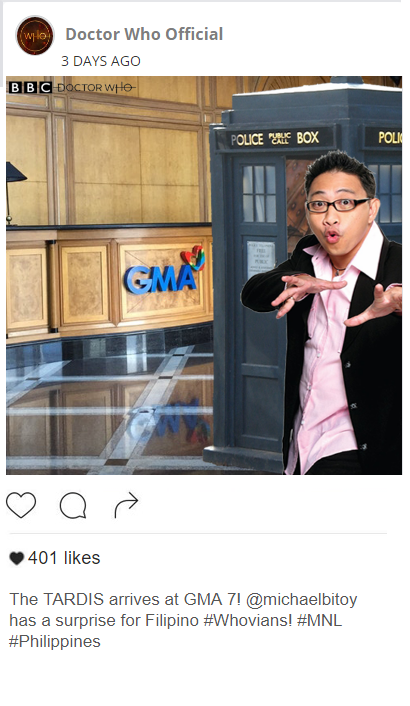 The post, captioned with “The TARDIS arrives at GMA 7! @michaelbitoy has a surprise for Filipino #Whovians! #MNL #Philippines,” tags popular comedian Michael V. The post, which can be seen here, has since then garnered both jeers and praises from fans. While the post hasn’t revealed much, it says enough for fans to make their own theories. The most prevailing one is that GMA 7 and BBC are in talks of making a Pinoy Who spinoff given the popularity of the Doctor Who franchise in the Philippines. If this is true, it makes sense if BBC will tap into GMA 7 for the doctor serye, and GMA 7 will likely accept the proposition. After all, if ABS CBN’s Bagani is set to be a long lasting fantaserye, GMA has got to have a backup serye to meet the competition. So far, Jennylyn Mercado’s The Cure is set to rival Bagani, but not all are hopeful for its performance. Of course, given both GMA 7 and BBC have yet to make any official announcements, all of these are just speculation. However, the deleted Instagram post and a previous Doctor Who “tease” do make these speculations hold a bit of ground. Not to mention that given Bagani’s strong start, GMA has got to leverage on something to rival ABS’s growing fantaserye. Although Bagani has been compared with GMA’s previous fantaserye Encantadia, the former does have its own merits. Save for comparisons with being a “Sentai,” Bagani does seem on the cusp of creating a world the likes none of which has seen, even with Encantadia. Unlike the latter, Bagani takes the fantasy genre with a dash of Filipino folklore. Much of the terminologies and concepts in the series so far seem to take roots with Filipino mythology, with a Filipino aesthetic to match. The GMA counterpart, on the other hand, while with similar Filipino based concepts, took theirs with a Western spin. If the previous Doctor Who tease was any indication, it seems veteran actors are still being considered for the role of the Filipino Time Lord. It’s yet to be revealed if Vic Sotto is still being considered for the role or if he’s going to be an executive producer. Given his popularity as Enteng in Okey Ka, Fairy Ko!, it wouldn’t be much a surprise if Sotto had a role to play in the Pinoy Who show. DON’T MISS: The 'Gilmore Girls' are baaaaaack! Other actors considered for the role aside from Michael V and Sotto are Pen Medina, Ronaldo Valdez, and Leo Martinez. Companions, which commenters in the deleted post have coined “ka-bessie,” also appear to be up for speculation. These include Alden Richards, Miguel Tanfelix, Julie Ann San Jose, Barbie Forteza, and Kris Bernal.